WASHINGTON — Ukrainian troops launched a “special operation” against pro-Russian separatists in eastern Ukrainian towns. Their first target was an airfield seized by the militants. Reuters reported that the airport was recaptured by Ukrainian forces in the town of Kramatorsk. However, the rest of the operations are not going as well because the military is ill-equipped for actual deployment and operations, as the Wall Street Journal pointed out. 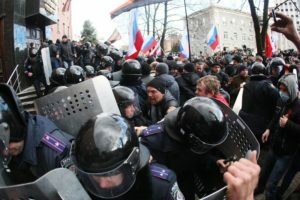 After the Crimean peninsula was surrounded, invaded and annexed by Russia last month, the Ukrainian government is timid to respond to any pro-Russian protests or seizures of public buildings or facilities with military force. In all, about 10 towns and cities in eastern Ukraine have seen pro-Russian separatists take control. It has some worried that this is a rebirth of the Cold War between Russia and the U.S., and led to the Ukrainian military partially mobilizing their soldiers as Russian soldiers are massing along their borders.